NC State College of Veterinary Medicine fourth-year student Laura Johnson has combined her love for her prospective profession with her undergrad degree in Creative Writing to produce a prize-winning essay. 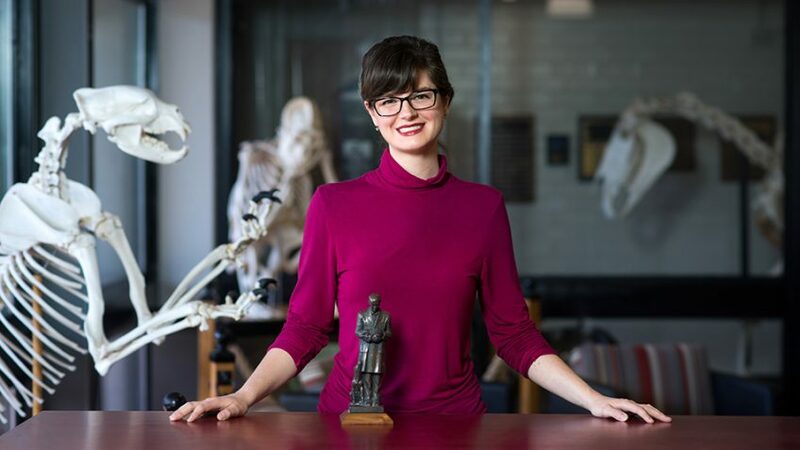 Her treatise entitled “The Origin and Legacy of Christian Petersen’s Gentle Doctor” earned her second place in the American Veterinary Medical History Society’s annual Smithcors Student History Essay Contest, along with a $1,000 prize. The Gentle Doctor is a sculpture created by Danish-born artist Christian Petersen in the late 1930s and subsequently displayed on the campus of Iowa State University. It depicts a concerned veterinarian in a lab coat holding and quietly comforting a sick puppy while a mother dog sits at his feet looking up expectantly. The statue stands before a bas relief collage of scenes depicting the hard work of large animal veterinary medicine. The contrast between the rough work in a farm setting and the gentle clinician represents the evolution of the veterinary profession. Since its first appearance on the campus in Ames, Iowa, the sculpture has appeared and reappeared in several incarnations, and along the way has become something of an iconic symbol for the veterinary profession. “I first saw a photo of The Gentle Doctor about five or six years ago,” Laura says. “Then, last spring, I happened to be on the campus at Iowa State, and I tried to find an opportunity to see it in person, although I wasn’t able to do so.” She had wanted to enter the essay contest for some time, and being reminded of the sculpture increased her resolve to find the time in her demanding schedule to get the entry done in time for the April deadline. Laura’s essay examines the intersection of art and science at a fortuitous time on the campus at Iowa State. “Christian Petersen was the first sculptor-in-residence on an American university campus,” Laura notes, “and the first college of veterinary medicine in the United States was also the one at Iowa State.” In a stroke of kismet, Petersen’s studio happened to be situated adjacent to the college of vet med, and the rest, as the saying goes, is history — history worth writing an essay about, it turns out. Laura points out that the sculpture was created at the same historical moment when veterinary medicine was evolving from being perceived as a rather raw, barnyard activity to a more modern scientific and compassionate parallel to human medicine. That both veterinary medicine and an artistic presence on campus should come together in one place at Iowa State was a watershed moment in both art and science. Laura was insightful enough to capture those concepts and record them in a gracefully crafted and thoroughly researched manuscript that captivated the judges. At the same time, Laura is quick to point out that “NC State is great for a variety of reasons. It’s a top tier school — it was my first choice — but it’s also a great value, being one of the most economical of all the colleges of veterinary medicine.” Even so, however, the financial award from the contest was a welcome bit of assistance with the still-considerable expenses of graduate school. 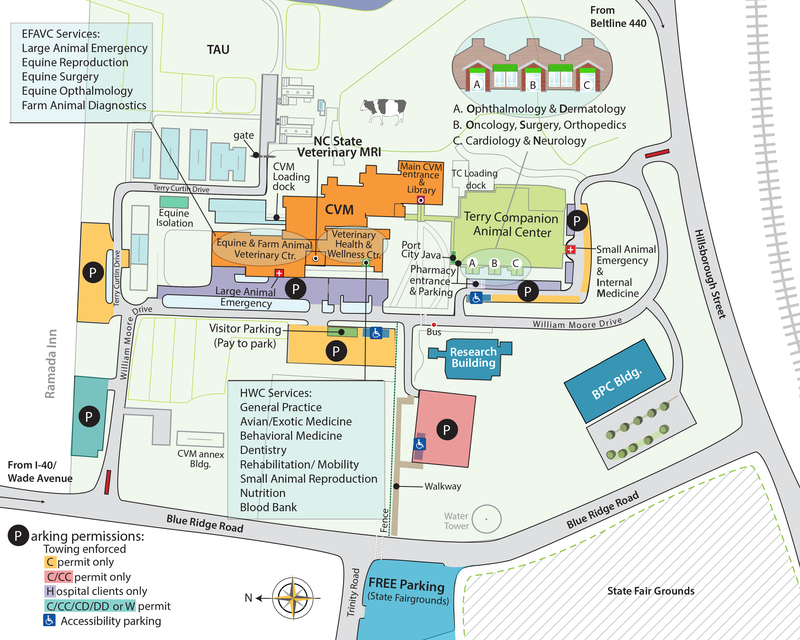 Laura comes away from her experience with The Gentle Doctor with a heightened appreciation for the role of art in medicine, including the sculptures on the campus of the NC State CVM. As she sees it, it’s part of providing sensitive and compassionate care for both animals and their owners, and that’s what contemporary veterinary medicine is all about.